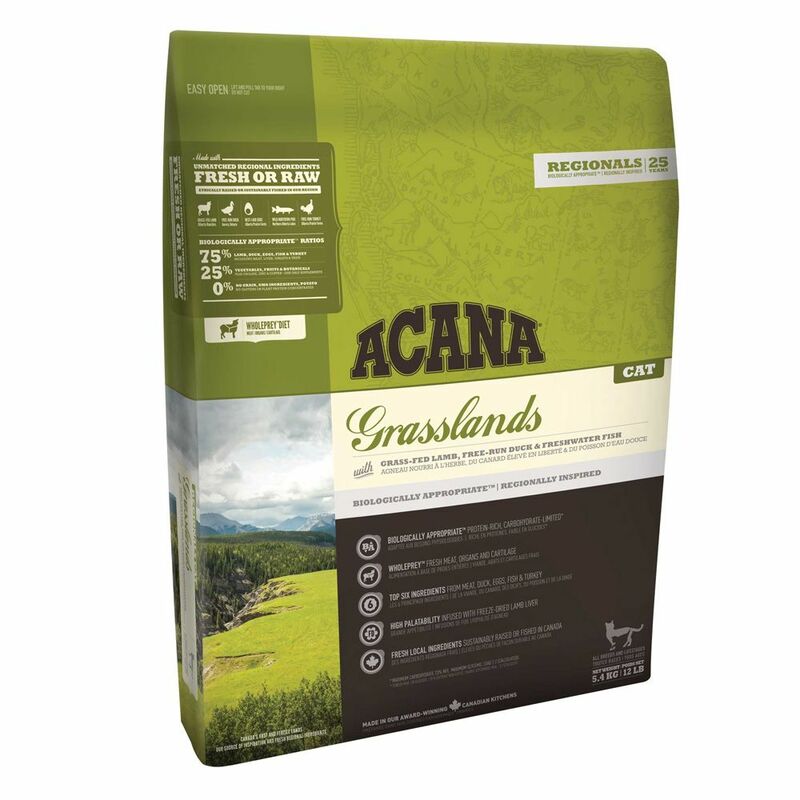 Acana Regionals GraΒlands is a biologically-appropriate, complete dry cat food. This tasty kibble is based on the WholePrey™ principle which contains fresh meat, organs and cartilage in the appropriate ratios. It reflects the food your cat would have eaten in the wild where it would have consumed entire prey animals including protein-rich muscle meat, nutrient and vitamin-rich offal and calcium, and phosphorus-rich bones and cartilage. This dry cat food is grain-free and has a low carbohydrate content (25%). Arcana Regionals dry cat food provides your cat with a balanced nutrition with all the nutrients, vitamins and minerals it needs for a healthy lifestyle. It has a high animal / fish protein content (75%) with a healthy mix of different sources of animal protein. This dry food is enriched with fruit and vegetables, and plant extracts, all of which provide your cat with the vital vitamins and minerals it needs. Acana uses only the very best, fresh, regional Canadian products to produce this healthy cat food. It uses fresh lamb, free-run duck, whole nest-laid eggs, wild-caught northern pike, and free-run turkey from western Canada, all of which are healthy sources of animal protein and rich in important nutrients. The fruit and vegetables are harvested and delivered daily from local farms. All Acana products are free from artificial additives. The top-quality ingredients ensure your cat can enjoy a balanced, wholesome meal every time. Acana Regionals GraΒlands dry cat food at a glance: Premium quality dry food for adult cats of all breeds Mirrors your cat's natural diet in the wild: to help your pet stay healthy and happy Top quality ingredients: all ingredients are sourced from regional, Canadian farms and fisheries. They are of human grade quality and delivered fresh every day WholePrey™ meat ratio: reflects your cat's natural wild diet and uses meat, organs and cartilage in the correct ratio to meet your cat's dietary needs 75% meat: 50% of the meat content is fresh meat. This is an excellent source of animal product with a hearty, delicious taste 5 sources of protein: fresh lamb, free-run duck, whole nest-laid eggs, free-run turkey and wild-caught northern pike from sustainable sources 25% fruit, vegetables and plant extracts: from local Canadian farms ensure that your cat gets all the vitamins it needs. They also help to keep the digestive system working well Low in carbohydrates (25%): The kibble is free from potatoes, tapioca and starches. It contains locally grown lentils and chickpeas which have a low glycaemic index which can help to prevent obesity Grain and gluten-free, no GMOs or plant protein concentrates: suitable for cats with nutritional sensitivities or allergies No artificial additives: this food is made using top quality ingredients and provides your cat with a natural, nutrient rich food which doesn't need additives With zinc, choline and copper: These are the only supplements used in this kibble Vitamin E: a natural..